Through our strategic partnership alignment with Telecom Plus PLC, one of the newest but most successful telecom service providers in the UK, we are proud to be able to announce the availability of ultra-fast fibre-optic broadband to over 80% of businesses across the Capitol. Backed by "Which?" 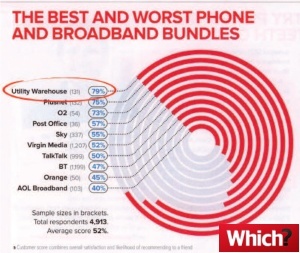 magazine who have consistently awarded them their "Best Buy" and "Reccommended Provider" awards for broadband more often than not, Telecom Plus have also consistently come in the top 3 rankings for Customer Service since Which? 's surveys began. With speeds of up to 10 times the speed of a standard broadband connection and an unlimited data allowance, there has never been a better time to upgrade your line for complete peace of mind. 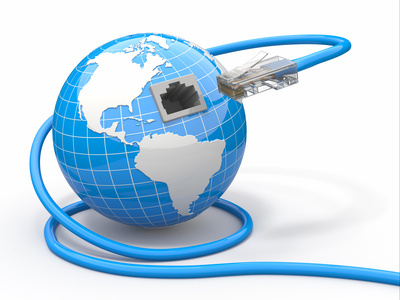 If you're moving or expanding into new premises, Telecom Plus are our preferred installer for land lines as a basis for your Internet connection, as their hassle-free ordering system will ensure your installation will go smoother than with any other provider. Click below for full details of the current offers from Telecom Plus, who now do business as "The Utility Warehouse", or call us now on 020 36 1000 36 for a personalised consultation, so that we can work out the right solution for you.